Botanically known, as Rebaudiana is a sweet herb, which is a native of Paraguay. This sweet herb is likely to become the major source of high potency natural sweetener for the growing natural food markets in the years to come. This natural sweetener replaces the chemical sweeteners and even table sugar. The sweetness in the leaf is, due to the presence of an intensive-sweetening agent called "Stevioside". Experiments have proved that Stevioside is 300 times sweeter than cane sugar apart from being a calorie free sugar. Hence has been named as "CALORIE FREE BIO-SWEETNER OF HIGH QUALITY". 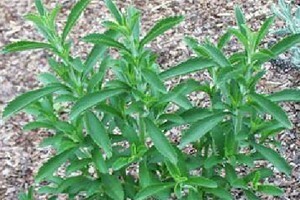 IBG research stevia program deals with the Identification of particular Steviol Glycosides. Development of a quantitative testing that can be used to check the amount of sweetening ingredients. IBG involved in stevia breeding since 2006, developed stevia project in Ethiopia for Mr. Daniel Yammer a titanium magnate. Also cloning propagation was done in a plant selection for amelioration of the sweetening agents. IBG also developed crop-growing protocol that ensure high yield in a multi-harvest system.